Miles and Nicky are getting married. Unfortunately, their wedding party is a tangle of ex-housemates, ex-friends and ex-lovers. So this wedding isn’t just a wedding, it’s a reunion. Can anything be salvaged from the past? And what really happened between them all, back at university? 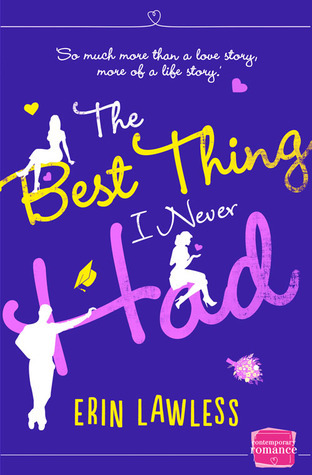 The Best Thing I Never Had is a great read with fabulous characters. Divided into past and present events this story’s structure allows the reader to know the characters in-depth and really want to know what happens to them which I liked. The focus of the first section is the long-awaited wedding of two of the group of university friends and it is here the reader realises something momentous occurred in their shared past but doesn’t know what. Just over half the story takes place in the past although pacing of this section of the book allows you to experience events with the characters as it happens which makes it easy and interesting to read. The second half surrounds the wedding and how the characters have fared since university. There are a few surprises both in character development and plot. This was my favourite part of the story possibly because the characters were less annoying and more world-weary. The characters are vivid. It’s easy to love or hate them. This is all about the people what they think, what they feel and what they do. The plot is not the main focus of this story but it does hold some pleasing twists. Packed full of emotion and humour this story is definitely worth reading even though it is longer than is currently fashionable. I look forward to the next book by this author.